My delicious cooking experiment for dinner tonight, 4/16/15. 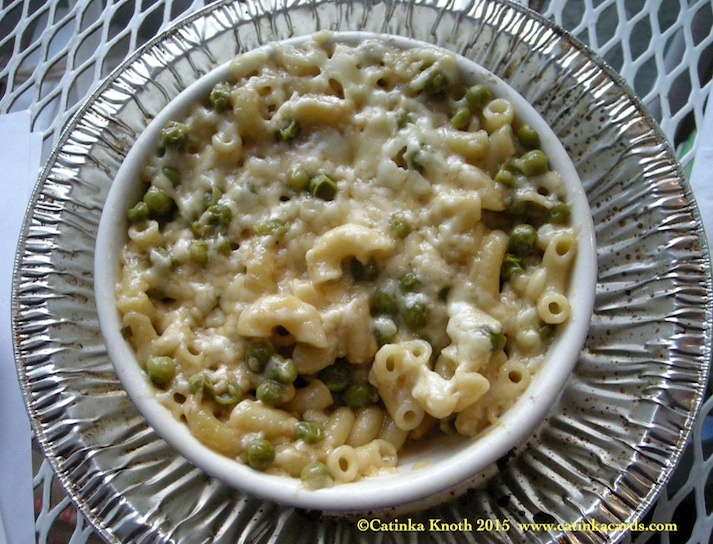 Have never truly made mac n cheese. This was a test to see if I could make it in my stove-top 'oven' invention - the 'oven' made of two aluminum pie plates, some tin foil, set to cook/bake in the cast iron fry pan on my stove-top burner. two 1/8" slices sharp cheddar cheese - enough to cover the top. 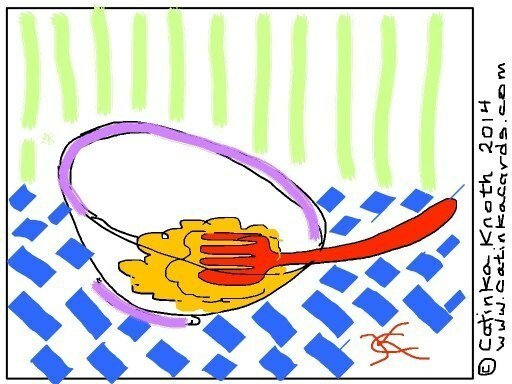 Macaroni first in the bowl, (seems to be a one cup bowl). seasoning & vinegar sprinkled over mac. Water even with the cheese. Cover with a tinfoil tent, shiny side down. Set in foil pie plate. Cover with inverted foil pie plate. Set in fry pan. Cover fry pan. Cook til done with heat set to low/mediium - #3 on my burner gauge. I cooked an hour. Was probably done earlier. At some point I could hear things steaming and sizzling over. Turns out something was getting over the edge and burning, but not the food in the bowl. It was excellent. I have saved half for tomorrow. 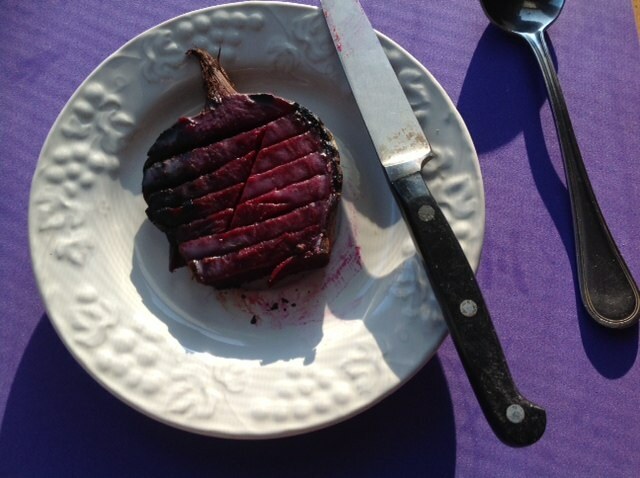 And the beet goes on - stovetop pan roasted beet, or potato, for one. 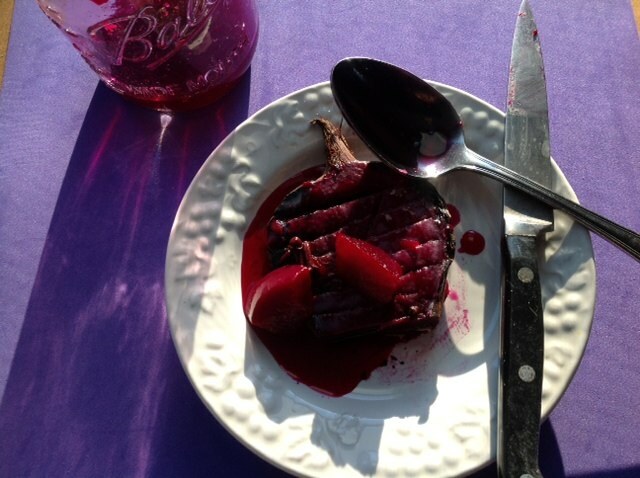 A) Leftover beet with butter, cold slice. It was the middle slice and was 'baked' in my little make-do fry pan oven. B) The root piece tasted good. D) Taste. See that skin around the edge, like the crust on a slice of bread. E) Gone except a touch of woody skin and the top. Stove top pan roasted beet or potato. Inspired by an unusual baked potato looking like a piece of bread served me at a Christmas dinner. I loved the slice of breadness of it so went home and tried my own version. It works for potatoes, and now beets it turns out. Since I cook single servings, don't use a toaster oven, microwave, and certainly not a big oven for one vegetable, I often use the cast iron fry pan on the stove top. I finally realized that aluminum pie pans, leftover from commercial pies, make a great little oven inside the covered fry pan - the closest thing to cooking with dry heat - baking. For a potato - slice it in 1/2" slices the long way (end to end, rather than around its equator. That will be two slices for a small potato, and three for a large potato. Keep the skin on, (after you wash the potato well). The middle slice ends up with the skin around the edge. Place slices, skin side down, in the pie pan in the fry pan, which has been preheating at #3, (is the gauge on my electric stove - moderate or just above low). Cover with another pie tin. Then cover the fry pan too. It will char after a while. I have not timed how long. I just try to check it. The slices need to get flipped. If it ends up being cooked thru already, then no need to flip. (You do know how to check for doneness w a knife or fork?!) When done, serve lots of ways. Even just ketchup is good! Butter & salt; vinegar; salad dressing; cheddar cheese; caeser dressing; sour cream. For a beet - wash well. Cut the same way (as the potato) - root to top, 1/2" slices. Keep the skin on. It takes longer to cook than a potato. When done, spread butter on the openface side. Slice down almost all the way thru the skin, so the butter will seep into the cuts. Sprinkle of salt would probably be good. 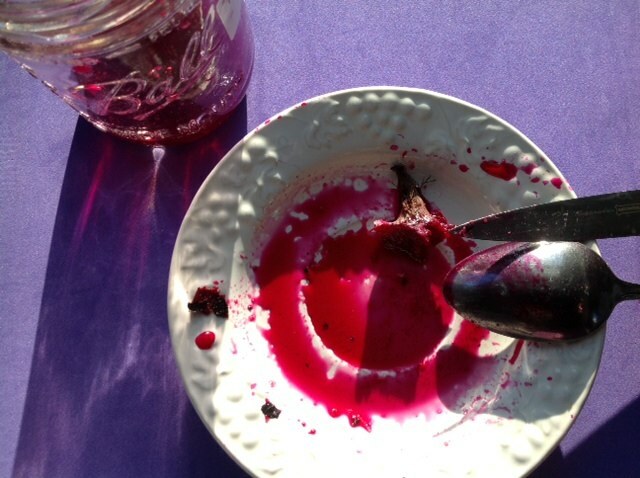 I have been adding a wonderful pickled beets juice leftover from a friend's homemade pickled beets. You can use vinegar. 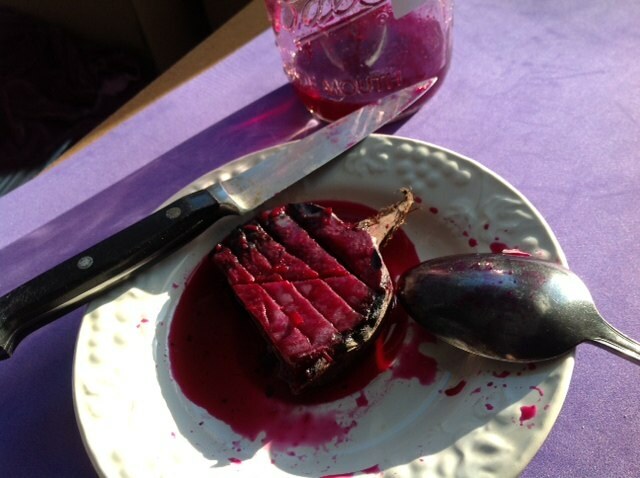 The surprising discovery here is that the skin tastes good with the beet. Just trim off a few 'hard' bits if there are any. 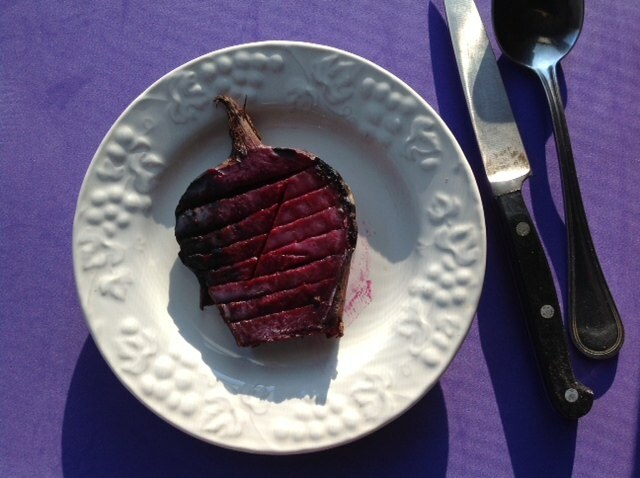 The roasted beets are delicious. a kind of pie crust but made with unheard of Extra Virgin Olive Oil (EVOO). Preheat covered cast iron fry pan on stovetop while preparing the ‘cookie/tart’. What temp? Number 3 setting of the electric stove (the low side – as hot as can be with out getting the pan burning). Add splashes of cider, or cold water, while mixing quickly as possible. This has to be done by feel. One has to develop a feel for how much one needs. One does not want to develop the gluten, so mixing must be quick but thorough. The liquid needs to be distributed at the start by how you pour it in. As soon as the dough starts pulling together form it together a bit more with your fingers and use it to grab up all the stuff on the sides of the container. Shape this onto a piece of tin foil. I did not pregrease it but found it would have been better if I had. It can stick. Shape into whatever cookie or tart shape you want, about 1/8” – 3/16” thick. Create a lip all around the edge to hold in the juices. Lay in ¼” slices of a macintosh apple, skin on is fine and lovely, in whatever arrangement you want. Dot it over the apples. Create a little tinfoil raiser for your baking sheet by folding a piece of tinfoil in half and z folding it. The little tinfoil baking sheet sits on top of this so that heat can circulate in the fry pan and act somewhat like a little oven. So, set the ‘tart’ onto the foil ‘grate’ and with a spatula quickly slide it into the fry pan and put the cover back down. You can only raise that cover for a second or you will lose too much heat. Let this ‘bake’ c. ½ hour. You cannot check too often because you will lose too much heat in the checking. After 15 minutes, the apples should be looking soft. 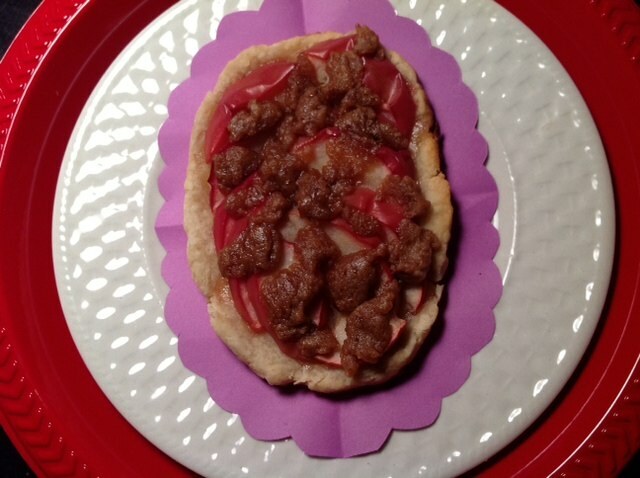 The butter, sugar, flour mix did not mix with the apples as desired. It did not matter though. It is done when it seems to be! If the apples look cooked. The crust only burned where some apple juice leaked over the lip of the crust. Remove from the heat and let sit tented while it cools. The first half of the tart tasted pretty good once it cooled. The remainder went into the fridge wrapped in plastic wrap. It tasted odd the next day. On the second day it was delicious. So perhaps let this sit covered in the fridge a couple days before eating! The One egg omelette over open faced cheddar cheese and tomato English muffin. The Aye's have it! 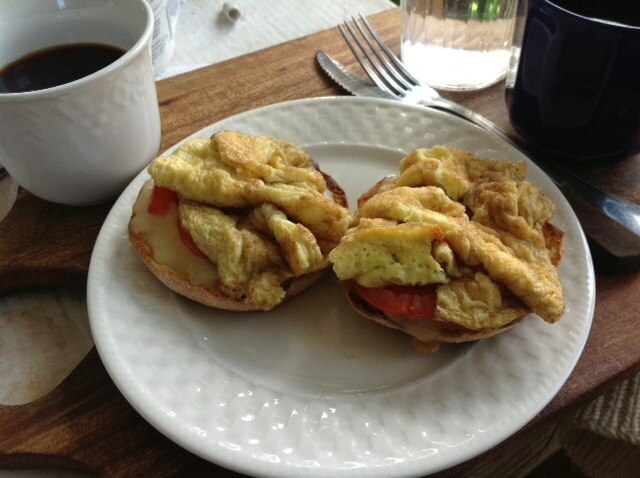 One egg omelet over open faced cheddar cheese and tomato English muffin. Discovered how to make one egg omelet this fluffy. Bring the egg, (still whole), to room temp by letting it warm in a cup of hot water. Break the egg into a container or bowl. Add some cold water. Aah - but how much is the question. I can't answer that yet. I have just experimented w dashes under the faucet, daring a longer dash every time I try this. Use a fork to whip up the egg & water til it is frothy and getting bigger in volume. The water allows the egg to incorporate air into itself easier. .. Hold the container tipped and the fork tines almost perpendicular. The fork should be at a slight tilt as well. Anything to get air into the mixture. Remember how in swimming or rowing, you should not be splashing? In this case you should be splashing but keep it tight. That is why the bowl is tilted - to keep the mixture in a small place. It will grow. Grow it as much as you can. Meanwhile the muffin etc has been cooking in the cast iron frying pan, or not. The pan should be preheated by now, whether you did the muffin too or not. 1/2 - 1 teaspoon of butter spread across the pan with the spatula. Butter needs to grease up the edges of the pan a bit too. Pan should be hot but not smoking. Butter will brown immediately. Careful - not so hot you smoke it. Pour the beaten egg. Move the pan about to make sure the egg gets everywhere, in case your stove is tipped. Put the cover on. Egg should be setting up immediately. Peek to see if the edges are curling off the pan sides and the egg seems cooked. If so, then lift it gently and flip it. It should be so big and floppy that it will wrinkle some when you turn it. Keep that cover on. it just takes a moment's cooking on the other side. I think it puffs a bit more with the turn. Cut it in half with the spatula and lay a half on each muffin half. Or, just transfer the omelette whole onto a plate. Do what you want with it. I was amazed how big I got it and that it did not deflate. Sorry I don't have water measurements. This is by feel and by eye first, (like mixing paint and water in a watercolor painting). Besides, every variation will be delicious. The more you experiment and do it, the more feel you get for what the ingredients will do together. My previous try did not have enough butter in the pan, so the mixture was unable to stay whole and had a few other problems. That just fell apart. But that taught me that I had to have enough butter. (Egg sticks to pan, cannot be turned properly, etc.) No amount of reading this stuff in cookbooks will teach you this. You have to experience the wrong ways almost as much as the successes. That experimentation and learning is what makes it such fun. .. Yes, season as you wish before you eat!